For school, work, or leisure, Victor Reader Wave offers everything you are looking for in a digital talking book player at an affordable price. 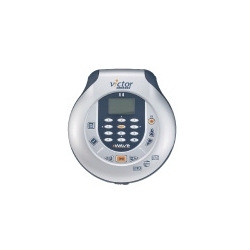 Victor Reader Wave is a sophisticated DAISY talking book, MP3, and music CD player. The Wave's advanced functionality allows you to read highly structured school books, manuals, and reference books, as well as novels and magazines. The Wave offers increased performance over its companion product, Victor Reader Vibe, including faster book navigation and improved MP3 CD features. * Ideal for blind, low-vision, and learning disabled users. * Blind and low vision users will enjoy the familiar telephone-style keypad, tactile zones, and audio feedback for controls and navigation. * Learning-disabled users will benefit from the large-screen display of navigation commands, book title, and section headings. * Audio message and visual progress bar for reading position. * Audio and visual indicators for volume, speed, and battery level. * Variable-speed playback with auto-pitch compensation. * A very compact DAISY CD player. o Dimensions: 148 x 138 x 29 mm. * Supports all DAISY navigation levels: Go to chapter, section, page, paragraph, or custom bookmarks. * All inclusive package: Earphones, power adapter, carrying case and rechargeable batteries. * Batteries can be charged within the unit. Also runs on standard AA batteries. * Simple firmware upgrade via CD. * Supports DAISY IPP-protected books.